I would first like to start off by saying that I am grateful for the release of the eth Cepher in mobile form. I wanted to get the book but atm it is too costly for me and the mobile app allows me to read from the eth cepher so for that I am very grateful. Sometimes when I am reading a certain area I stumble upon a world that should be in the mobile lexicon but isn't. Since I don't have the physical lexicon I am not sure if it found there instead. For example if I were to look up Gadr'el, Satan or Lucifer in the lexicon, for some odd reason he isn't there. 1. The expansion of the current app Lexicon. 2. The addition of the paleo hebrew characters for the restored names in both the books and lexicon. *. The restored names in the books of the bible can have the paleo Hebrew name next to the restored name similar to the hallelujah scriptures. *. 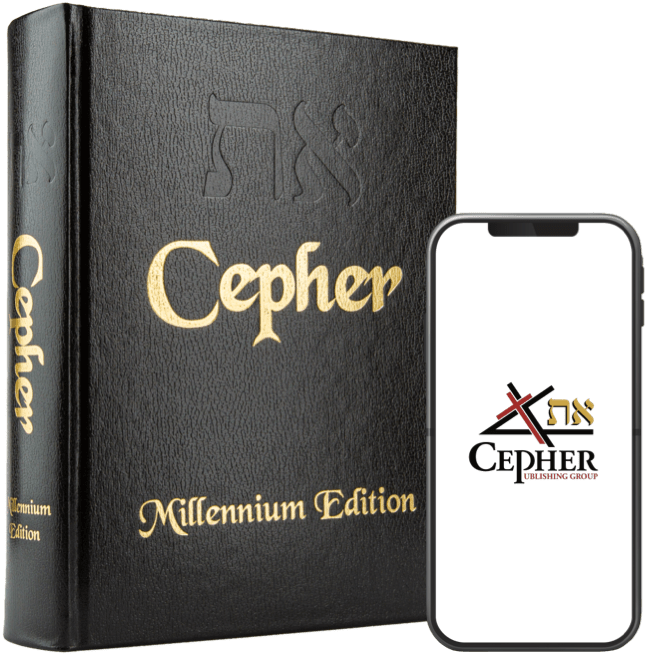 A Hebrew-to-English chart of the most common names and places found in scripture can be taken from the eth Cepher book and added to the app as an additional feature. *.For those that want to enable the addition of the paleo Hebrew characters to the bible books, or disable such a feature a setting can easily be added to the settings options. *.The ability to search the lexicon for specific words, with the addition of word auto suggest and autocomplete. Do a search on amazon for a product to understand what this means. 3. The option in the settings menu to have Yahuah or Yausha's words colored red instead of the default black. 4. The ability to write notes for a specific word or several consequitive words in a sentence and not the whole paragraph. We have talked about the Lexicon being expanded into a full blown concordance. We will expand the Lexicon to include much more information. Please be patient with us. We are a very small company and we currently have a lot of tasks on the table, but we are committed to making the expanded Lexicon a reality. Shalom. Where is the night vision located. The "Night Mode" is located in the "Home" tab. Thank you to all the team behind this amazing translation and resource. Anyone looking for the full council of Yahuah will be greatly blessed by your hard and diligent service. I would like to see the personal pronoun (eg he, his etc) for Yahuah to be capitalized to clearly distinguish between Him and everyone else. May our Saviour pour out His blessings on all of you without measure. Loving the app so far! I just left a review on the google play store before I realized there was a forum for this. Is there any consideration for desktop access? I can only imagine how much work has already gone into this and you're doing a wonderful job. I love having it with me everywhere I go but for quiet time at home, reading from the computer screen would be much more comfortable. Thank you for all your efforts! We are considering a desktop study application for the future. We will keep you posted if and when this project gets underway. Can this Cepher App be accessed on more than one device? For example, my phone AND my tablet. If you have more than one device that is of the same platform, you can download the app to both devices. However, if your devices are of a different platform such as: Apple and Android, you will have to purchase the on each device. Will you be adding a Backup function? Or at least, can the notes file be copied and stored elsewhere, from folder the Notes are kept? ..... where is that folder on an Android? It would be great if the notes file could be copied or backed up to another phone / tablet, to / from a Google (Android) or the like drive online? Text notes would be great, so that they can be incorporated into any word processor. We have not discussed a backup function, but we will consider it in the future. Thank you for your feedback. I want to start off by saying thanks for a great app. A lot of time and attention to detail has gone into both the app itself as well as the text. Its a great tool and I cant wait to buy the printed copy. As for the feature requests. 1 I would like to second the request for a backup or a way to export notes to some form of word document for storage and sorting on a personal computer. 2 I use the app on 2 different devices, my phone when I'm at work and at home I use my tablet. Some sort of sync would be great, with a dropbox account for example or google drive. That way you dont have to develop and manage web servers etc. 3 Night mode is great, but having all Samsung devices with AMOLED displays a completly Black background uses much battery. A third option for Black mode would be awesome just change the background color from gray to black. 4 The highlight feature is great, would it be possible to label each color to distinguish what topic differnet colors are for. Also the addition of unlimited or at least more colors, with the option to pick colors. Love my Cepher and the mobile app, though I would hope for a selection of different fonts for the mobile app. Fonts like Times New Roman and such. I will check with my app developer to see what we can do about selecting different font styles. i have a sight problem and find that the type is too small. i can not make words big enough to read comfortably. your first version of this app it was able to make reading words large enough to read why did you change it? PLEASE FIX THIS PROBLEM.